Balmer Lawrie & Co Ltd Junior Officer Jobs Recruitment 2017: Balmer Lawrie & Company Limited invites application forms from the eligible candidates for Junior Officer vacancy at various departments. 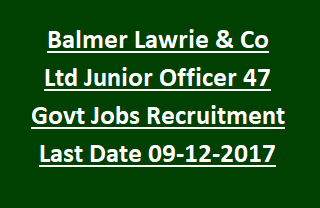 There are total 47 vacancies available in Balmer Lawrie & Co Ltd Recruitment 2017. Application form for desired vacancy available from 15-11-2017 at BL official website http://www.balmerlawrie.com. Interested candidates have to fill the application and submit before last date 09-12-2017. Application fee for Junior Officers Vacancy is Rs. 500/- plus Rs. 50/- as Bank charges. No Application fee for SC/ST/ PwD candidates. Payment of application fee starts from 23-11-2017 and closed on 12-12-2017. Diploma/Graduate/ Master’s Degree in relevant field from recognized University. Maximum age limit as on 09-12-2017 is 30 years. Selection of candidates for Jr. Officer Jobs in Balmer Lawrie & Co Ltd Recruitment is based on their skills in personal Interview. Basic Pay scale for the post Jr Officer is Rs. 9000/- to Rs. 22000/- (Rs. 4 Lakhs per Annum). More details regarding application fee payments, Application Procedure, Age limits, Pay Scale, Selection method of Balmer Lawrie & Co Ltd Junior Officer Jobs Recruitment are mentioned below. Total Vacancies available in Balmer Lawrie & Co Ltd Recruitment are 47 posts. Post Name: Junior Officer: 47 posts. Minimum Qualifications required is Diploma/ Degree/ Master Degree in relevant Field from recognized University with Hindi, English as one of the subject at Graduation/ Master Degree level. For more details see the notification. Selection of candidates for Junior Officer Jobs is based on their performance in Personal Interview. Application fee for general candidates is Rs. 500/- plus Bank Charges Rs. 50/-. Application fee for SC/ ST/ PwD Category candidates is Nil. Interested Applicants have to log in BalmerLawrie official website. Click on the link for registration. Click on desired vacancy and Enter the basic details. Starting date to submit prescribed application is 15-11-2017. Last date for submission of application is 09-12-2017.